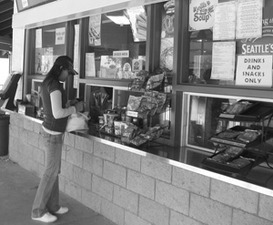 The San Clemente Island Grill is a new innovative type of snack stand at Steed Park in Rancho San Clemente.An innovative type of snack stand just opened in February in San Clemente. Yes, it still has the small, rectangular, sliding glass doors along the bottom of the huge, thickly paned front window. It posts the large signs inside with big letters indicating menu items including hot dogs, hamburgers and French fries. Yes, if you’re tall, you have to bend down with your chin on the counter to give your order. 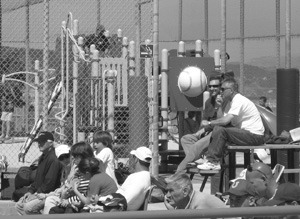 Yes, it’s surrounded by softball fields and even has a tot lot with a huge baseball featured. But, after all that, the familiarity stops. Richard Steed Park’s food vending service has a new operator, the L.M. Catering Company. Naming it the San Clemente Island Grill, the owners, experienced restaurateurs and local residents, Gary and Meg Greenberg, have over 60 menu items listed for the consumption of visiting softball players and their families, as well as local athletes. They’re inviting all San Clementeans to come visit their new eatery for tasty dining pleasure, to enjoy a friendly but competitive ball game, watch the sunset over the rolling hills, and, in the near future, view a favorite television show on a wide HD screen. How about a Surf-Rider, turkey or ham with Swiss cheese, or Pareo Wrap Combo or a Big Kahuna Angus Burger Combo, all served with a choice of fries or side salad and a small drink? Maybe you’d like Zombie Island Zucchini, or Mozzarella sticks, or a Starbucks Mocha Frappaccino to sip. The funnel cakes, Funky Monkey or Strawberry Monkey also look tempting. And, if you’re looking for healthier alternatives, there are also such delicacies as Caribbean Chicken Caesar Salad, Garden Burgers, or an Aloha Bowl, all identified on the menu by the “okay” hand sketch. Even breakfast is served for the early arrivals. Short Stack Pancakes or Belgian Waffles and Strawberries are popular, or you can munch on a savory egg, ham and cheese breakfast sandwich, burrito, or quesadilla, along with Seattle’s best coffee. With a staff experienced in quick, high-volume and friendly service, L.M. Catering Company, a family business operating over the past 14 years, handles over one thousand attendees in a 15-minute period during performances at La Mirada’s Performing Arts Theatre, for which the Company handles the food services. As a catering organization, the Company has also provided food and beverages for business meetings, conferences and seminars. Always maintaining an “A” grade from the Health Department, the company prides itself in organizing a clean and safe environment and emphasizing the best of customer service. The Grill is open, depending on game and practice schedules from Monday through Friday, 4am. to 8pm, or at the end of the last game scheduled, and Saturday and Sunday from 7am to 8am to 6 or 10pm, depending on games played. Local girls’ softball, softball tournaments and little league, adult leagues and local youth teams all use the fields for practices and games. The Steed Park Sports Complex, recently undergoing a $1.5 million renovation, includes four lighted softball fields, batting cages, a small children’s play area, a concession/rest room/office building, and, in close proximity, a skate court and two dog parks. Outside the vending window, there is a roofed area as well as outside space for eight to ten tables, all of which will be used for dining purposes. Twenty of the company’s employees are available to serve at the San Clemente Island Grill, which is managed by Jacque and Maria Majeau. Gate admission to the baseball fields is $1 for all entrants, and neither dogs nor alcohol are allowed. “We want our menu and customer service to speak for themselves,” Meg added. “When a funnel cake goes out, people see it. They ask, ‘What is that?’ Then they come and order it. We even do healthier stuff with spinach wraps, tomato, basil wraps, and Maria and Jacque also make sushi. Even the Greenberg kids help out. Alexia (13), Mathew (11), and twins Jacob and Jacqueline (9) can run the cash register, clean and wash. “They can do everything but use the hot grill and make coffee,” their mother said. Youngsters can play in the tot lot while the fans watch the game.The couple also plans to display brochures about San Clemente shops and restaurants for out-of-town visitors and sell hats and T-shirts with “San Clemente” on them. They’ve already had numerous visits by skateboarders and find them very polite. The Greenbergs should have a liquor license within 60 days that will enable them to serve beer only during times adults are using the facility. “Gary and I want to be a part of San Clemente,” Meg emphasized. “We’ve lived here since 1997. Our kids go to school here. We want to show our commitment, and perhaps have the opportunity to operate other venues in town. This is what we do as our business. A new business like a new baby,” she added. According to Carla DiCandia, San Clemente’s Recreation Manager, “We’ve been quite pleased with the presence of Gary and Meg Greenberg as concessionaires. We’ve received positive input regarding the pricing and quality of the food. They’ve been really easy to work with in terms of their flexibility and helping the public re-adjust to having a concession operator out there. I think the hardest adjustment was the reintroduction of a gate fee and the prohibition of alcohol and outside food/beverages being brought into the park. The only complaint might be from softball players who really look forward to ending their softball games with an icy beer.